Lotus-shaped open fires, running waterways and private cabanas amidst green bamboo groves and sweet frangipani trees create an exclusive haven in the city where unique treasure of liquid delights is right at hand. 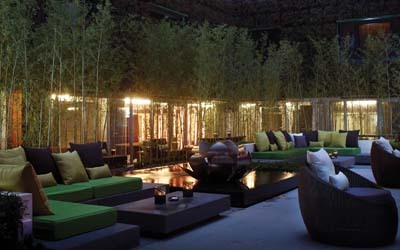 Book a private cabana and charge up a hip night out with a cool urban edge. Party hard to live DJ music under the stars, kick back with breezy mojitos, wide selections of wines, and original bar bites that are perfect for sharing.